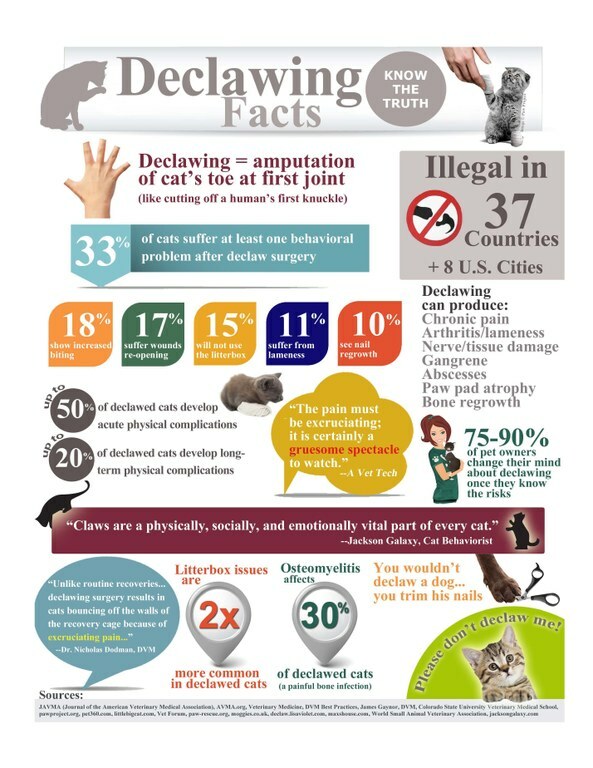 To understand exactly what happens during the surgical procedure, let's examine what declawing actually entails. 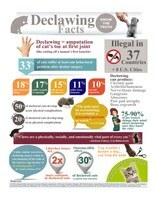 Declawing is not merely the trimming of the claws. It is the surgical removal of the claws, which are closely adhered to the bone. In order to remove the claw and prevent its regrowth (which sometimes results from incomplete removal), the entire first joint of each of the cat's "toes" is amputated. This procedure is often likened to amputation of all a human's fingers to the first knuckle. You can imagine the subsequent pain. The comparison ends there, however. Cats walk on their "fingers and toes"--we do not (but imagine the pain if you had to, after amputation). Cats depend primarily on their claws for defense-- we do not (but imagine your helplessness if you did, after amputation). Aside from the initial pain, other short-term effects of declawing can also lead to long-term problems, both physiological and behavioral. A declawed cat's toe stubs will be severely painful for days or weeks after the surgery, and "phantom limb pain" may be a lifelong legacy. Some litter box substrates are very painful to the cat's tender paws, and he may avoid the litter box entirely because of its association with pain. Owners can help by using a softer substrate such as one of the paper-based litters. A cat's claws are his primary defense against other cats, dogs, or humans who would harm him. Lacking his claws, he may turn to biting, either in defense, or as a "warning" to humans who can't read his "body language." Other cats may choose "flight" instead of "fight," and become withdrawn and depressed. Cats are "digitigrade," which means they walk on their toes. Pain in the toes can cause changes to their normal gait, which eventually can cause stiffness and pain in their legs, hips, and spine. Anyone who has ever experienced prolonged foot pain will understand exactly what I'm describing. Nail Trimming - Cats cannot do the serious damage to furniture, drapery and rugs, with blunt nails. Trimming is a simple procedure, and if you wait until your cat is sleepy and quiet, and take it one nail at a time, over a period of several days, your cat will soon find out it's not to be feared. Simply lightly squeeze the cat's toe to extend the nail tip, and snip the tip. You can buy inexpensive clippers for this purpose at any pet store. Be careful not to cut into the dark part on the underside of the tip-- this will cause bleeding. If you're hesitant about doing this yourself, ask your veterinarian to teach you, or read my How to instructions on this subject. It's a lot less expensive than declawing, and a lot easier on the cat and your conscience. Scratching Posts - Invest in, or build your own, scratching post(s). Sisal-covered posts are highly favored by many cats. Most cats can be easily trained to use the post instead of your furniture. Scratching Posts can be obtained through pet stores, or if you have any carpentry talent at all, you can build your own. Don't stint on the number of posts. Many cats enjoy having several surfaces and elevations (vertical, horizontal and plane.) Fortunately, one of the most popular surfaces is cardboard, and inexpensive cardboard scratching posts are readily available. If one post doesn't work, get a second one, and experiment with their locations. Offer kitty a variety of surfaces and elevations, and he will soon choose his favorites. Soft Paws - Soft Paws were developed by a veterinarian, and are vinyl nail caps which glue right over a cat's claws. They come in clear or colors, which can look quite fancy, and also are easy to locate if one should come off. The caps grow out with the natural growth of your cats nails, and are said to last four to six weeks, on average. Feliway - Feliway is a "friendly pheromone" which mimics the scent of cats' facial glands. It has been found to be useful in combating cats' urine marking tendencies, as it is thought that cats will not mark with urine where they have previously marked with facial glands. Although Feliway is not marketed for this purpose, some behaviorists believe it may be useful to curb undesirable scratching.